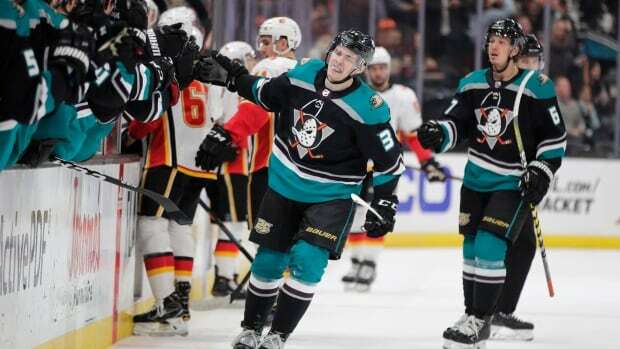 Anaheim's streak of six straight playoff appearances will end next week thanks to its disastrous 5-21-4 midseason slump. But the Ducks will return in September with a wealth of young talent — including two promising rookies who put Anaheim up 2-0 less than seven minutes in. Derek Ryan scored and David Rittich stopped 29 shots for the Pacific Division champion Flames, who will start the post-season next week as the top seed in the Western Conference. With nothing to gain from a win, the Flames rested several healthy regulars, including 82-point scorer Sean Monahan and 78-point scorer Elias Lindholm. "I didn't think we had a lot of jump or a lot of fire," Ryan said. "It's kind of tough to play in a game like this, but you still have to find a way to be professional. We had our chances, but [it was] just kind of a lacklustre performance in my opinion."